Carolyn Seepersad-Bachan, Political Leader of the Congress of the People (COP), said on Monday night that it doesn’t appear that the Constitution (Amendment) Tobago Self-Government Bill reflects what Tobagonians want in terms of self-governance. Seepersad-Bachan comments followed views, opinions and proposals expressed by residents at a discussion at the Scarborough Secondary School, hosted by the COP for members to gain an understanding of the issues in preparation for upcoming debate in parliament. 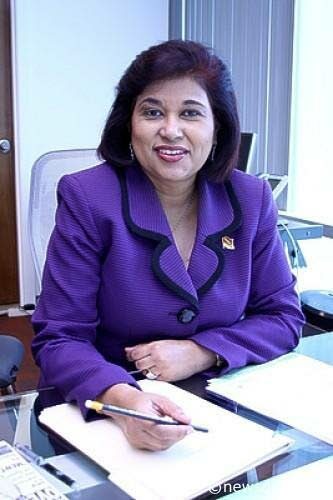 She advised that Tobagonians return to the drawing board, since it appears that the current draft bill was “giving a lot of power but no mechanisms for accountability.” She argued that the bill was copying the ineffective governance already affecting Trinidad and it does not described the right structure to meet the needs of the people of the island for an improved, sustainable economy. During the discussions, Curtis Douglas, Vice President of the All Tobago Fisherfolk Association (ATFA) argued thatchanges must be made in the bill but only Tobago must be given the opportunity to make these adjustments. “The problem starts when Tobago has to ask Trinidad for permission to be free…This bill should cover all that Tobago wants because it was promised to us in the first place, that’s why the Prime Minister made the promise to us. I believe Tobago must have its own central government, its own central banking, Tobago taxes must remain here, Tobago must be able to borrow and invest without Trinidad,” said Douglas. Resident Clyde Adams advocated for a federal system of government through the bill. He said he does not support the idea of dis-integration between Tobago and Trinidad but more meaningful discussions on the bill must be hosted in Tobago with Tobagonians, before any further action. “What we want is more empowerment in Tobago. We do not want an anyhow kind of arrangement where they give us something and someone sitting at the back with a big stick; this is what is already happening in Tobago,” Adams contended. “There some parts of the bill in my view that does not work well for us and I am saying if we are going with a new concept, we need a new mandate and for a new mandate we have to go to elections. He further suggested that while Parliament exists for Trinidad and Tobago, there should be a government for Trinidad and one for Tobago. Attorney Christo Gift, in his contribution, disagreed with the approach to the draft bill in trying to establish every detail in the foundation at once. “Why we should have it entrenched? It’s ridiculous and proven ill-founded in the context of what has happened between 1996 and now when they attempted to take the bill before Parliament. We should move step by step. This whole idea of taking one big chunk of it with all the power that we need in one bill, that’s not good with me. “There are aspects of the bill that are yet to worked out and if this is passed, what we are doing is making it hard for us to change anything if needs be,” he argued. Gift noted a narrow focus placed on upgrading the inter-island transportation service, and its impact on productivity, honesty and integrity on the island. He said Tobagonians want to make difference for themselves but problems with inter-island transport were making living and travelling in Tobago uncomfortable. “There are serious implications that will come with the power that this thing (bill) carries, if it goes as is. We want to make sure Tobago is a place we can live in still because we won’t be able to get away from the kind of legislation the bill will come with,” he said. He also said Tobagonians could not give their thoughts on the bill until they fully understand the contents and purpose of the bill, and called for more time for discussions on and preparations for self-governance instead of a hustle by political parties to use the bill to fulfil a campaign promise. Reply to "COP: Plenty power but no accountability"